Dog training is a tradition that is passed down from one trainer to another. It is still mostly an oral tradition that is shared from one generation of trainers to the next. I have been very lucky to have been taught by some truly excellent trainers. I studied under each of my teachers fervently learning their training approach as thoroughly as possible. I would obsess over every detail and nuance of their technique and approach to training. Learning these technical training details didn’t always come easy to me. I would spend lots of time frustrated, feeling very uncoordinated, and struggling with the timing of responding to the dog I was working with. There were many days where I felt like I was all thumbs! But eventually, after hours and hours of practice, I would have breakthroughs in my skills and begin to flow with the challenging techniques. At these moments the connection between dog and handler intensifies to an almost tangible level. To this day there is nothing as satisfying as this bond I experience with the dogs that I train. My personal training technique evolves and shifts over time, even to this day! When I learned different training styles from my teachers I worked to emulate their technique and form. Over the years, each of their methods informed my training approach. My style became a blend with the best approaches rising to the top. Some methods are suited to almost every dog, while others only work with certain dogs. I call this knowledge my tool box. Over many years my tool box has grown quite large, with a wide variety of training skills filling it. An old adage in dog training exists that the only thing 2 dog trainers can agree on is what the 3rd dog trainer is doing wrong. Sadly, this is still often true today. Many trainers turn on each other, attacking other trainers style, technique, methods, philosophy, and equipment choices. In my opinion this intensely critical atmosphere is harming the evolution of dog training. One of my great pleasures in life is watching another trainer work a dog using different approaches than what I would choose to use. I am always intrigued as to where they learned and what past experiences are informing their current method. I am forgiving to even the unskilled trainers that I observe, knowing that all trainers share a love for dogs, and that all trainers skills will grow over time. All dog trainers are a part of a tradition that goes back thousands of years all the way to the first dogs. There is literally nothing new in the world of dog training that hasn’t been done before, in a previous age. Even the most cutting edge dog training techniques of the modern age have been used by previous generations of bygone eras. From ancient Pharaohs’ of Egypt’s hunting dogs, to Roman dogs of war, to farm dogs of Europe, to sled dogs of North America, to dogs of the Far East, and everywhere else imaginable, all trainers have one thing in common– we are part of a continuum of people that keep the ancient tradition of dog training alive and well throughout the ages. Click on Scheduling to book you and your dogs FREE Consultation with Master Trainer David Kabler. Bike Rides Are a Canine Adventure! David out cruising on the bike with his Husky mix Daisy. At Kabler School For Dogs I love teaching clients with athletic dogs to safely bike together during private training courses. It is quite a thrill to look down at your best friend running in stride next to you while cruising on a path. So many dogs benefit from this additional exercise and some dogs really love to pull and you barely have to pedal! It is so fun and rewarding to share experiences like these with your four legged bestie. In this video you can see how my Husky mix Daisy loves to ride with me– every ride with her is special! Riding with Summer during an introductory bike session. 2013 was an incredible year of training here at Kabler School For Dogs. At the end of a year, and the beginning of a new one, I always enjoy reflecting on all the fabulous dogs and guardians who have graduated through the Kabler training program. I had the distinct pleasure of working with such a wide variety of canine breeds and personalities and had some wonderful success stories with some difficult rescue cases. There is nothing I enjoy more than helping dogs and their guardians forge meaningful and dynamic relationships. Weezie practicing her training during a West Asheville private session. My courses are designed to give you and your dog only the best one-on-one attention. The Kabler method is based on years of experience training hundreds of dogs. My approach is intuitive and designed to take all of my dogs and guardians on a successful training journey. I had such an awesome year working with all my clients and their canine best friends. Working with dogs brings me immense satisfaction. It is always rewarding to watch the relationship between human guardian and canine grow while in Kabler training. The most popular way to train at Kabler School For Dogs is through my private sessions. Private sessions are one hour in length and are run at public parks, in the clients home, and in urban settings. My programs can be purchased in blocks of sessions or you may qualify for one of my unique open ended guaranteed training courses. During your dogs training session you can expect to learn a variety of training requests and problem behavior solving techniques. I always wrap up my classes with written homework so my clients know exactly what to work on in-between our sessions together. Whether you are an experienced or a beginner canine guardian my courses will provide you with excellent information and my unique training perspective. Quite the pair. Bjorn and Hanne practice a perfect down and stay request while looking handsome and gorgeous. At Kabler School For Dogs I offer one of the best residency training programs in the business. During your dogs residency they live in my home with me and are spared the harsh reality of a kennel environment. Each of my residency house guests are trained, walked, and played with daily. My beautiful fenced in yard provides a safe outdoor exercise area. 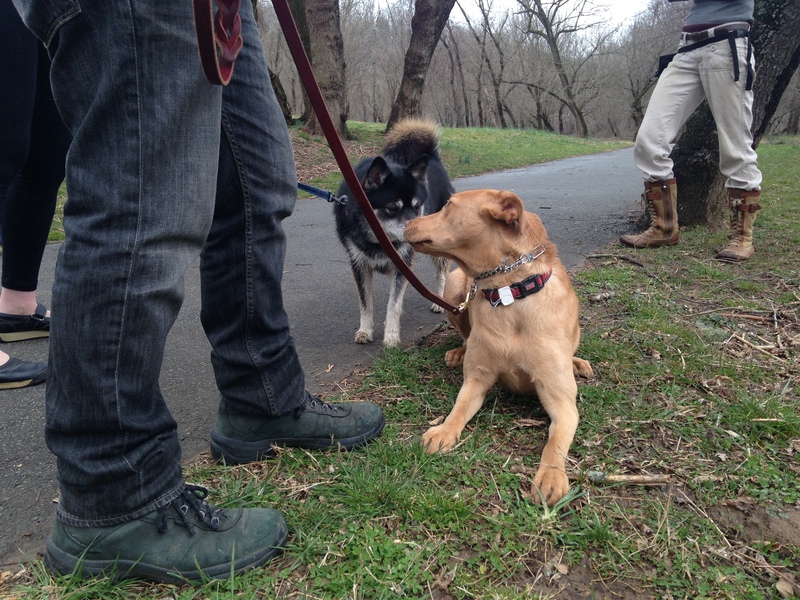 Excursions to the park and downtown West Asheville provide new distractions, socialization, and training experiences. Ruby practicing holding her down stay request while a strange dog approaches and says hello during a private session at the park. I am so excited from such an excellent year of training and am looking forward to all the new dogs and guardians that I will have the privilege of training in 2014. If you are looking for an exceptional training experience for you and your canine best friend please say hi. I absolutely cannot wait to find out about your dog. Happy training and happy New Year! Cattle Dog Bindi looking alert while waiting for a reward. 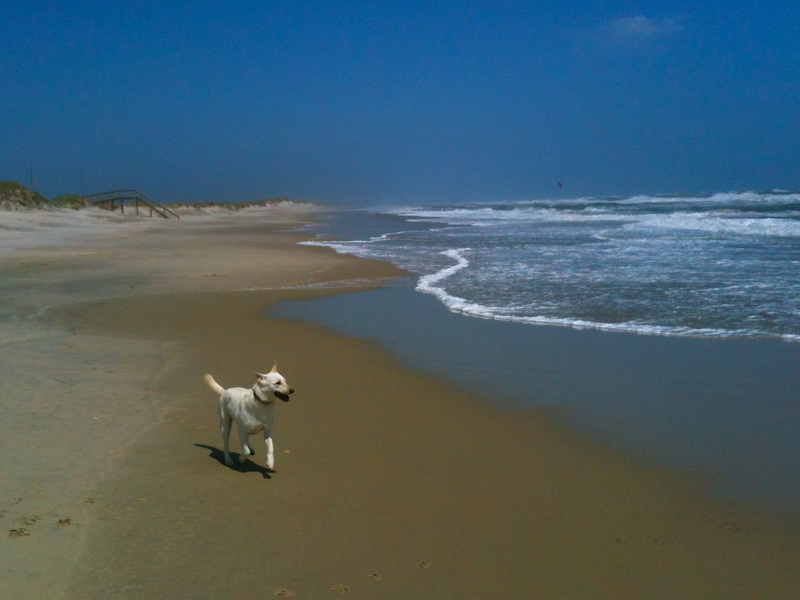 Daisy having fun on this years trip to Hatteras Island. As 2012 comes to a close, I find myself reflecting on all the wonderful clients that my apprentice Kim and I have had the opportunity to work with this past year. It has truly been four fabulous seasons of training canine best friends and their human Guardians. There is nothing we like to do more than to facilitate creating better canine/human relationships. Adorable Mountain Feist, Squash, at 8 weeks. This past year started off on a great note with a new puppy, as I assisted in raising and training Squash, a gorgeous Mountain Feist. I absolutely adore Terriers, their incredible energy, and strength of will. I was fascinated as we played tug with this intelligent little guy and thought about my own childhood Terrier, McDuff. It has been so fun watching Squash grow over the past year. Eli, relaxing during our training session. Over the Summer, I met Eli, an incredible German Shepherd Dog who was suffering from fearful territorial aggression. He was under socialized as a puppy and, at a year and a half, was showing aggression towards anyone not in his immediate family. He spent our entire consultation lunging, snarling, growling and barking at me. I immediately recommended a de-conditioning program to help alleviate the cause of the aggressive behavior and also started his foundational obedience. We were able to successfully rehabilitate this handsome boy, changing his behavior, eliminating his aggressive responses, and complete his Tethered and Untethered obedience training. Chippie Lee and Barley learning obedience and overcoming sibling aggression together. Also over the Summer, I enjoyed working with Barley and Chippie Lee, two siblings who were suffering from intense aggressive sibling rivalry. They erupted into a very tenacious fight during our first training session and it was obvious that Barley was over reacting in a big way to any perceived transgression on the part of Chippie Lee. I taught them and their Guardian proper obedience– effectively setting up their Guardian as a strong leader. Today these two are happily living together with no more sibling aggression. Jack absolutely thrived during his stay at the Kabler house. In the Fall I trained Jack in my Residency Training Course. My Residency dogs are guests in my home where I can really focus on teaching house manners. Each guest goes for walks and is trained daily. I really enjoy taking Residency Guests on field trips. Sunny Point Cafe, Hickory Nut Gap Farms, French Broad River Park, and downtown Asheville have all been destinations. Asheville has a new and amazingly effective training option. This program offers incredible results and is so fun for your dog! Bernese Mountain Dog Ellie learned so much during her Kabler Residency Training. Kabler apprentice taking time for snuggles after obedience practice. In 2012 Kabler apprentice Kim Turley has also been progressing in her training knowledge and ability. I have been so excited to see Kim’s confidence grow as she becomes a skilled trainer and instructor. Watching her learn to train has brought back many memories of my own experiences as a young trainer and my desire to discover the best techniques and methods for teaching canines. I am so proud of Kim and am looking forward to seeing my apprentices continued progression in 2013. In the Fall, I worked closely with Jenna Yarosh at Patton Avenue Pet Company to establish our unique Puppy Preschool Class. Few things compare with the excitement of raising a puppy and this class is designed to assist new Guardians. I love raising pups and in this class Kim and I teach optimum ways to socialize, house train, obedience train, and play train with your new family addition. 1.) There is no rush. While working with German Shepherd Dog Eli’s Untethered training I learned a valuable lesson about moving too fast and the importance of progressing slowly. As we were transitioning him from Tethered to Untethered obedience it became evident that he needed more time and lots of more play added into his training. This is one reason why in 2012 I have extended Kabler’s training guarantee to include lifetime follow up lessons– what I enjoy most is learning what the dogs have to teach me and I can only learn these lessons by taking a dog from start to finish and standing by their side for the long haul. Pitbull Bogie playing a vigorous game of tug during his training. 2.) Always remember to take time for play and praise. I love training dogs so much and sometimes get incredibly focused on teaching and then one of my dogs will look up at me and make a playful gesture and successfully instigate my playful side and remind me how important play is to both humans and dogs. I am reminded of my clients, a Golden Retriever named Obi and a Pitbull named Bogie, whose Guardians are learning to use play as a reward. Play and praise are often overlooked as motivational tools and it is incredibly important to use both of these whenever possible in addition to treats as positive rewards. 3.) Continue to work on becoming as good at reading human Guardians as I am at reading the dogs. I am incredibly focused on my dogs during training, so much so, that sometimes I need to remind myself that the human Guardian is just as important to the training process as the dog. It is important to remember that the dog and Guardian are a team. I constantly strive to train my clients holistically from this dual canine/human perspective. Working Dogs Get A Job… And Love It. Toby, Blaze and their Guardian Fred learning to work together. I was referred to David Kabler at Kabler School For Dogs by Aaron Bales (Owner/Manager) of Happy Tails Country Club in Fairview. I was looking for training sources for my 2 dogs, Toby, a 9 month old Labrador mix adopted from Brother Wolf, and Blaze, a 5 year old Shepherd mix from Asheville Humane. Blaze had been to obedience classes for 18 sessions during the 5 years before meeting David. I called David and he came out to our house to meet Blaze and Toby. I had called David primarily to work with Toby (the puppy). We made arrangements for David to work with Toby for 5 sessions at our house beginning the following week. As it turned out David told me to include Blaze as well, which I thought was great for them to get some training together. We began the following week with basic beginnings. Toby and Blaze are handsome boys– practicing Down and Stay upon request. What I have truly learned the most, is how to change my actions with dogs and how to positively guide them in situations, versus scolding them for unwanted behavior. I have seen vast improvement in both dogs and I have learned how to actively work with each dog on their strong points and their weaknesses. Kabler Dog Training is not just dog training, but people training as well. I had to learn how to teach and communicate with both dogs even though Blaze was further along than Toby. After about the 3rd class we would go out to wait for David’s arrival and both dogs were very excited to see David even though he was a very firm instructor. They enjoyed their time with Kabler School For Dogs, as did I. I highly recommend his classes. New Dog Training Column in Critter Magazine! David is excited to be writing a new monthly column featuring his unique dog training perspectives for Critter Magazine. Published monthly for over 15 years, Critter Magazine is an animal adoption publication that is available for free in Asheville, NC. Look for David’s article in the March issue of Critter. Critter believes in approaching animal welfare by promoting adoption, awareness and education about issues. Find out more information at http://www.crittermagazine.com. David’s first article will be about separation anxiety in dogs and how a good training program can alleviate their stress and symptoms caused by being separated from their human pack. Look for it in the March issue of Critter. Upcoming articles will be about training techniques for puppies and adult dogs. The articles will give unique insights into canine behavior. David is anticipating sharing his extensive canine training knowledge and experience with Critter readers all over Western North Carolina. Contact David now to schedule your dog’s FREE training and behavioral consultation. (828) 337-5792. Isaac no longer pulls on his leash. Isaac no longer pulls on his leash! We want to let you know how pleased we continue to be with the results of Isaac’s training. We have been on hikes with him, and he no longer strains at the leash and he sits when other hikers and dogs go by! We can walk on our road with Isaac on a slack leash. We have had compliments from house guests and neighbors on his improved behavior. Before we started your training we would hardly have thought this to be possible, especially in just a few weeks. Thanks for all your help!